Store cards in a place with a stable temperature. Ideal temperature for storage is 68 to 72 degrees, Fahrenheit. When returning cards to box after use, place a joker on top of each deck, along with a cut piece of cardboard. This serves to prevent warping. When cleaning KEM cards, use lukewarm water and Dawn dish detergent. Add a few drops of vinegar to the solution. Pat dry immediately after washing. Do not apply powder to the cards. 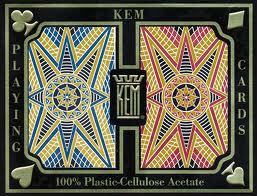 I've personally had decks of KEM cards that have lasted for several years. In the long run, it's less expensive to use plastic playing cards than regular ones, as the plastic cards are much more durable.